Agrigenomic research is difficult enough without having to coerce software designed for human genetics to work with the plant or animal species you're studying. Not anymore. 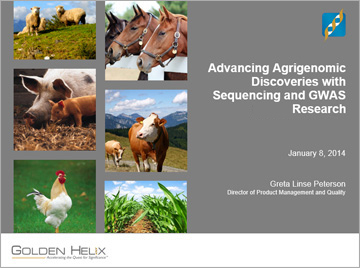 In this webcast, Greta Linse Peterson will present updated workflows in SNP & Variation Suite 8 (SVS) and GenomeBrowse for agricultural genetic research. SVS includes a robust suite of analytical tools and a revolutionary genome browser in one program to support a wide-variety of species including plant, animal, and parasites. New tools make it easy to adjust for inbreeding and incomplete pedigrees, making it even easier than before to identify variants related to pest and disease resistance, increased feed efficiency, milk production, and more. Topics to be covered include: supported file formats for importing data (including imputation sources like FindHap, Fimpute, and Impute2), comprehensive sequencing and GWAS workflows to take your analysis from QA to finding putative variants or SNPs of interest, common pitfalls to avoid and precautions when working with agrigenomic data, and visualizing results seamlessly in an integrated genome browser.